Bowl, tea lite candle holder or planter. Continental made. repaired expertly (see 7th pic), but otherwise lovely condition. A great trinket. A STUNNING FRENCH ICED WATER JUG BY ALPHONSE MOUTON ( ALPHO POTTERY ). A blue & tan drip glaze over a cobalt blue base jug. Difficult to make out but impressed ALPHO 201 ?. on the base. Maximum height from base to top of spout 18cm, base is 9cm. APPROX HEIGHT 22 cm, APPROX LENGTH 19 cm, APPROX WIDTH 9 cm. THOUNE VASE OF A PLEASING SHAPE AND MORE UNUSUAL BROWN GROUND COLOUR. SIZE ARE SHOWN IN PHOTOS AND CONDITION IS PERFECT. With an Orange Pink and Black/brown abstract design. "foreign, which would make it pre 1930's. with gilt detail. French Lustre Vase, dark blue with gold art deco style patternisation. Signed. 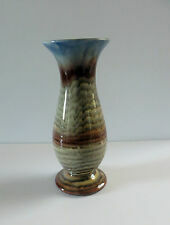 French Lustre Vase with an art deco design. Used but good condition. Good vintage piece. Height 20cm. Blue with gold colour decoration. Signed to base. The people of the Netherlands a would describe this plate as being Delfts Blauw Aardewerk. The plate has a Frisian proverb hand painted in the centre: Doch dyn plicht en lit de ljue rabje which we understands translates to: Do your duty and let the people chat. A beautiful large morrocan blue pottery plate. Luigi Zortea opened his pottry atstudio in Bassano,near Venice in 1922. Made of glazed earthenware typical of the region during the late 19th/early 20th century,known as "pezzi bianchi". This lovely vase dates to the 1920's. A Boch Freres vase by Charles Catteau which I believe would date to the 1920's. As you can see from the photos the vase is clearly marked to the base although there would have been a number after the D but this is smudged. Lovely vase / urn marked Italy. I believe this will be early to mid 20th Century. They do not appear to have chipped the ceramic. No significant cracks to note. LONGWY French Art Deco Ashtray. the base hole in thefalse bottom is very thin and as can be seen it has been chipped around the hole. Other than that excellent with just age grazing in the blue inner. Sought after Art Deco French Nabeul Carafe from Provence. Pair Of Antique Wall Plaques. Condition is Used. These were owned by my grandparents in the early 1900's They have lovely carved apples and leaves which originally were handpainted. One of the Plaques has small ammount of chips on the outer edges shown in picture, but can be renovated. Number on back is Austria 1548 for ref. Thank you for looking. Also it bears two original stickers " Guerin " & "Tourne A La Main ". In a olive green thick glaze with a twist handle. A rare and very interesting plate by Gabriel Fourmaintraux of Desvres, France. He made a variety of styles of ceramics but went on to create these incredible designs many of which are described as Zoomorphic Ceramics. Early 20th Century Art Pottery Jug. Made in Belgium. Circa 1920-1930. Stamped or partial stamp to base. 1000 French Longwy Vases. A pair of French Longwy art pottery vases. 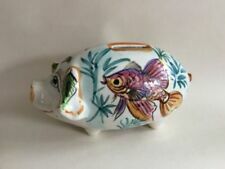 They are early 20th century in period and in the 'cloisonne' style which this factory is renowned for. The ground is blue with leaves and red highlights and the interiors are turquoise. Beautifully shaped vase decorated with Swiss alpines. An interesting ceramic pot made in Vienna with hand-painted design of crest, devils and mythical birds dating probably to 1929. Probably a souvenir item. Rare SEVRES Flat back. It s its on a rectangular shaped base. The base 11.1/4"x 2.1/2" (28.5. ). RARE VINTAGE CICADA VASE. FRENCH AEGITNA VALLAURIS, FRANCE, PICASSO CONNECTION. This stunning vase is the work of the celebrated ceramicpottery, Aegitna based in Vallauris in the South of France. Finished in Aegitna trademark yellow and brown. Dark green another, but rarer glaze. Art Deco Amphora Czechoslovakia pottery vase decorated with parrots on a brown ground. It is 17.5cm high and 13cm across. In good condition with no chips cracks or repairs. Marked to the base with various printed and impressed marked as pictured. Nice signed large French ?. (can't make out any of the marks on this piece, however stylistically I'd say it was French) Art Deco ceramic table lamp, with a very fine image, in the round, of a Buffalo. This stunning pitcher is the work of the celebrated ceramicpottery, Aegitna based in Vallauris in the South of France. Finished in Aegitna trademark yellow. Yellow and brown is a popular combination. GREAT STUDIO POTTERY. LENGTH ABOUT 18 CMS HT 4.5 CMS. wedgwood TO BASE. 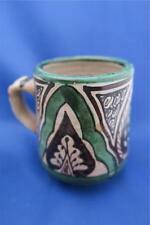 Item: A wonderful large Amphora Czechoslovakia art pottery vase beautifully decorated with stylised abstract design. Fully stamped to base as shown. 15 cm high 11 cm wide 7 cm deep. Boxer is in a sitting position. PAUL MILET SEVRES GREEN VASE. SUPER ITEM. RARE VINTAGE PINECONE PITCHER. FRENCH AEGITNA VALLAURIS. PICASSO CONNECTION. This stunning pitcher is believed to the work of the celebrated ceramicpottery, Aegitna based in Vallauris in the South of France. Finished in Aegitna's trademark yellow, brown and blue. Dark green being another, but rarer glaze. Made in Belgium by Boch La Louviere Feres. The base carries the Boch La Louviere stamp, impressed number 1252/1 and stamped code D.5468. For sale is this rare Art Deco bonbonniere / trinket box. This is a very rare Deco item. Two children on a basket, feeding a Pair of Rabbit. Subtle use of Gilt and Gilt Dusting typical of Imperial Amphora Pieces. Good Display Quality. Head on child nearest Rabbits has been cleanly reattached and is obscured from the front - see photographs. (This elegant white & brown narrow neck vase is an excellent example of Eschenbach Bavaria Porcelain, it stands 19cm tall. Eschenbach, Bavaria – Germany. 9. nd picture shows stamp on base). Made by Robj of Paris this decanter is in the form of a comical Scottish soldier / Highlander with kilt, sporran, tunic and bearskin. Very eye-catching piece indeed. 10.75" at highest point. Fully backstamped. MOUFANG GROSSH MAJOLIKA MANUFAKTUR KARLSRULE 1920. ART HARDBACK BOOK IN GERMAN. SERVICABLE USED CONDITION the cover is a bit ark with the cover spine torn to one side content seem good for age. lots of PICTURES & BACKGROUND. ACT Altwasser Carl Tielsch original antique art deco gravy boat with attached drip plate, drip plate size is 22 cm x 15 cm, gravy boat size is 19.5 cm long and 9 cm wide and 7 cm deep. STYLISH EMILE BRENNER BOTTLE SHAPE VASE. 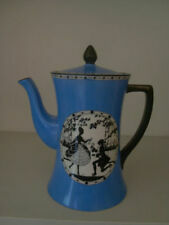 LOVELY GLAZE EFFECTS BAYEAU TAPESTRY SERIES. VERY GOOD CONDITION there is a small in the making indent small piece of outer rim where the pottery is not as wide to report. Lovely pair of hand painted coffee cups painted by the Italian painter Castelli. One of the cups has a small crack - please see photo attached. Boch Freres La Louvière Lamp bases. A nice pair of hand painted Belgium Boch Freres La Louvière lamp bases depicted with fine images of stylised flowers / fruit?. in roundels around the body and neck rim.